Fuel flow rate through an injector is affected by a number of different things. 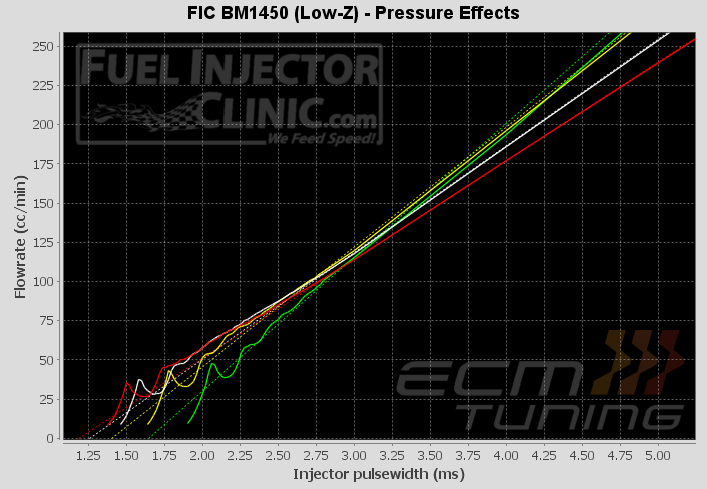 This page focuses on the effects of base fuel pressure and its influence on injector deadtime. Flow rate through an injector is substantially influenced by the pressure differential across the injector. If we assume that a given injector has been rated at the industry standard of 3-bar (43.5 psi), then the well-known formula for calculating the basic fuel flow effect of changing fuel pressure is below. But fuel pressure also affects how quickly the injector can open and close. Higher pressure differential (base pressure) increases the amount of force the injector internals have to overcome to start flowing. This increases the “deadtime” of the injector and needs to be taken into account. To illustrate this effect, we took a set of FIC BM1450s and ran them at varying fuel pressures from 35psi up to 60psi in 5psi increments. The results are shown below. Flow rate in that chart above was normalized to 43.5psi to illustrate only the effect on deadtime since the effect on fuel flow rate is easily calculated. If you really want to see the original, unaltered version, click here. Obviously changing base fuel pressure changes deadtime as well as basic flow rate. So both effects need to be taken into account when changing base fuel pressure.